Learning to change your own violin strings will save you from making expensive trips to the shop, letting you keep playing and practicing. 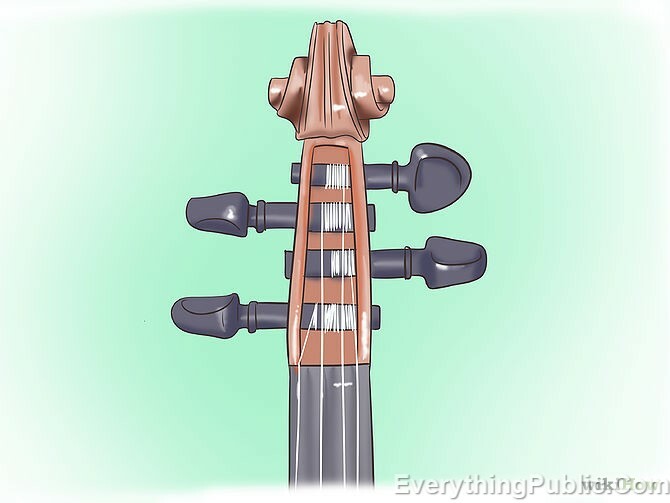 It’s a good way to get more familiar with the action of your instrument as well, learning to see how it responds and settles in to a fresh set of strings. 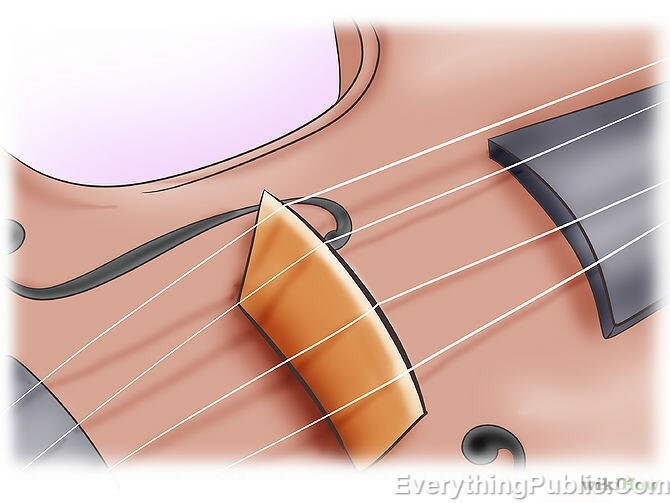 You can change strings, completely re-string your violin, and select the appropriate strings for the job. See Step 1 to learn to get a new set on your instrument. 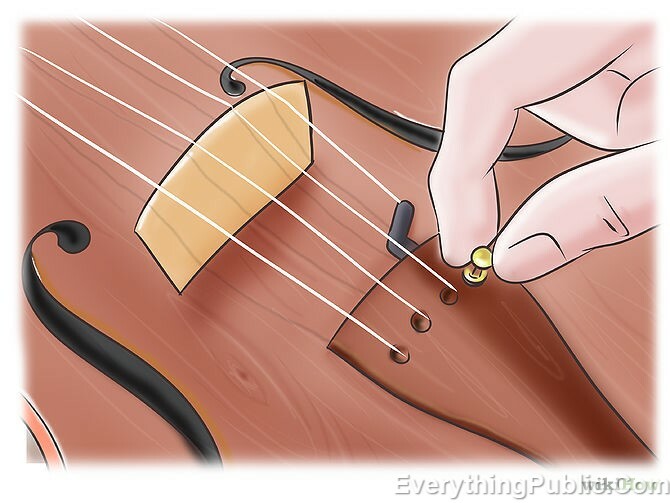 Twist the large tuning pegs toward you, so the string becomes loose. If you have fine tuners, remove the small metal ball attached to the strings from the tuners. If not, pull the string in the tailpiece toward you and pull up to release the string. Continue twisting the large tuners until the string is completely loose, and remove it from the tuning peg. 2. Orient the new string properly. 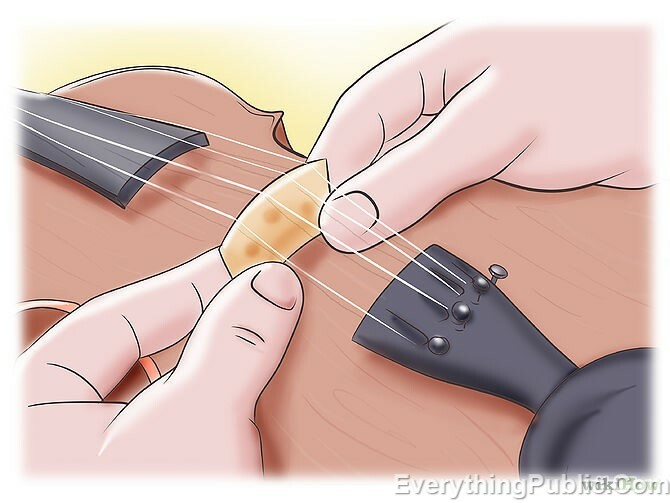 Remove the appropriate string from the package and find the tip of the string, which should be inserted into the tuning peg, and the bottom of the string, which should anchor the string in the fine tuner. 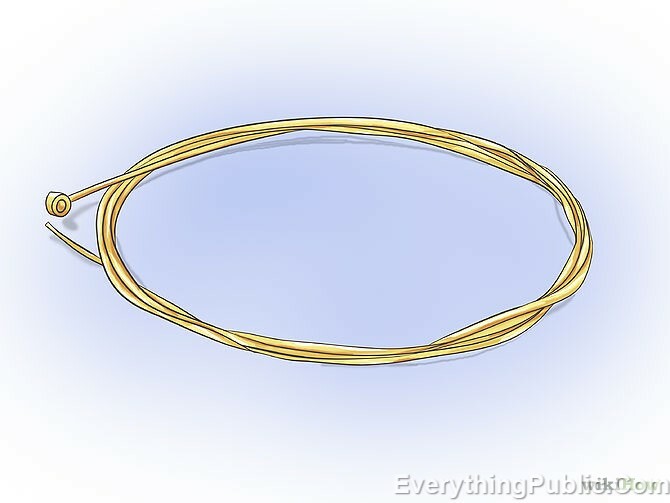 The top will typically be colored on the end to distinguish it from the other strings, and the bottom should have a small metal ball on the end to seat it in the fine tuner. The color depends upon the particular brand of strings you purchase. 3. Insert the string through the tuning peg. 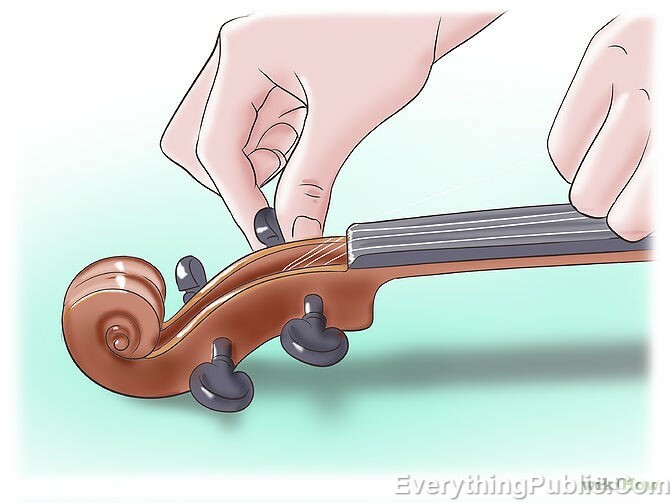 Holding the violin with the chin-rest facing you, find the correct tuning peg to orient yourself and locate the tiny hole in it. This should be inside the scroll. Insert the top of the string through the hole, far enough that about half an inch hangs out on the other side. 4. Seat the string at the base. If you have fine tuners, place the small metal ball in the appropriate slot. 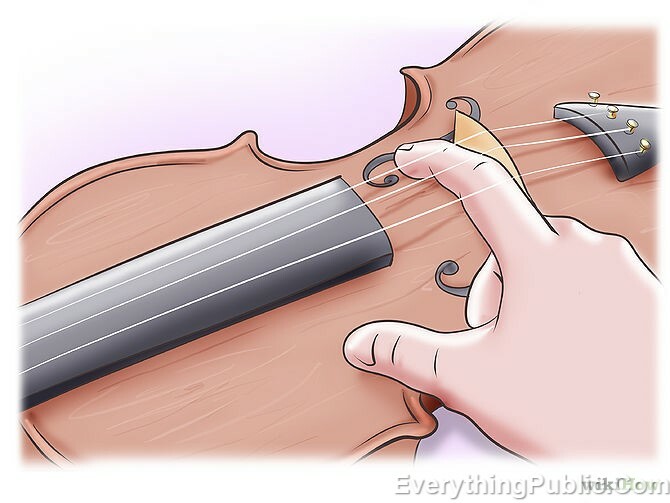 It sometimes has a tendency to pop out while you’re tuning, so check with your thumb regularly while you’re tightening the string to make sure the base is still seated in the fine-tuner snugly. 5. Start tightening the string by turning the peg. Turn the large tuner away from you, so the string wraps itself around the peg, tightening and taking up some of the slack. 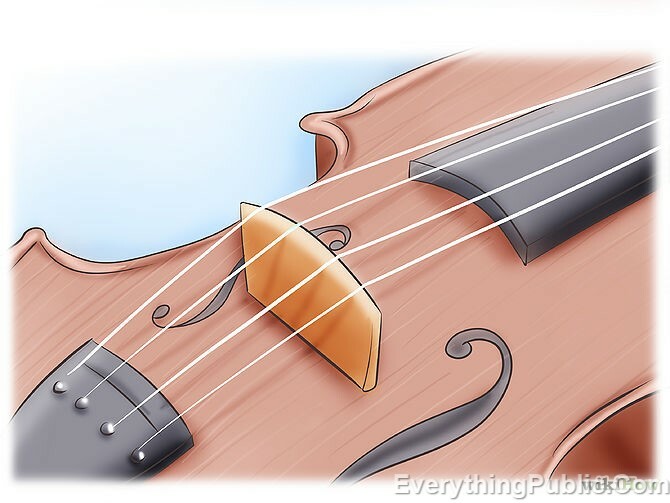 It can be kind of a balancing act, because you want to make sure the base of the string stays seated (pop it back in if it pops out) and make sure that the string wraps around the top peg as straight as possible, which will make it easier to tune. 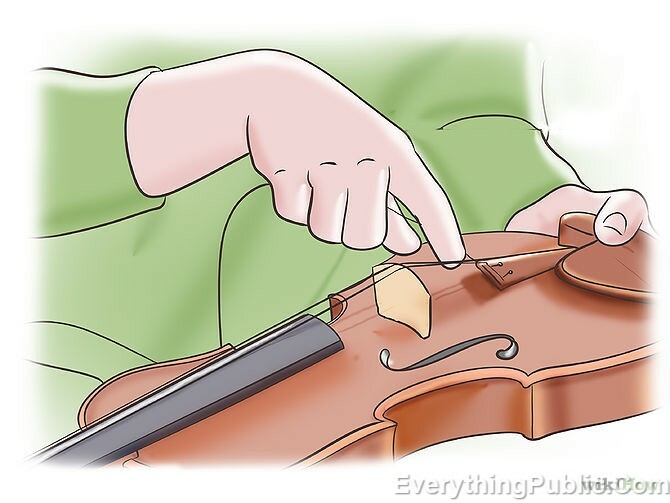 To keep the string wrapping straight, use one hand to turn the peg and the other hand to pull the string back away from the violin, so it stays tight against the peg. Make sure it wraps around the half-inch sticking through the other side, to hold it in place as you turn. 6. Straighten the string and let it rest. Make sure the string is in the appropriate notch in the bridge and continue tightening the string until all the slack is run out. 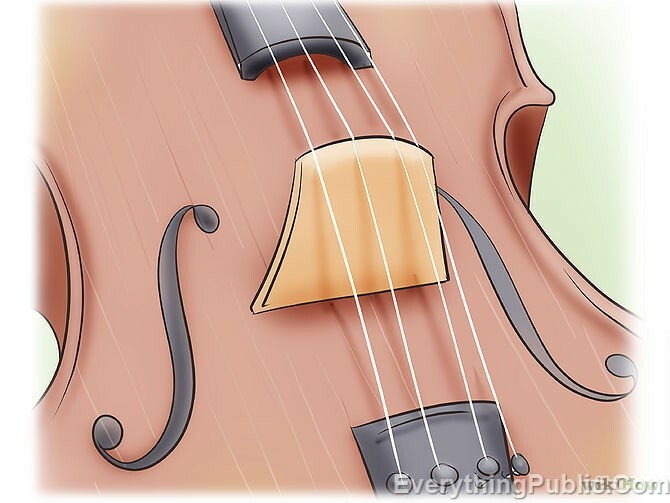 It takes a while for a new string to settle in, so don’t waste time fine-tuning until you’ve let the violin sit, sometimes for as much as several hours, before tuning it closely. Get it in the neighborhood and let the violin adjust to the new string. 1. Put on all the new strings and leave them slack. 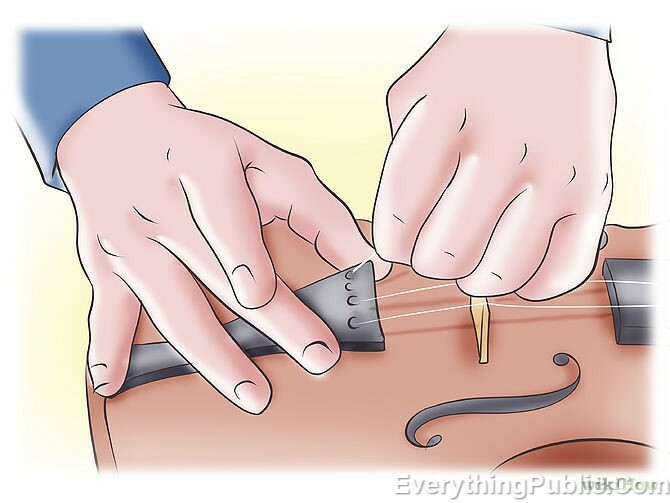 If you’re putting strings on a new violin for the first time, you’ll have to seat the bridge, which takes some care and measurement. The first step, though, is to put all the new strings on and leave them slack enough to slide the bridge under them and stand upright. Following the basic method for changing a string, letting them stay somewhat looser than you normally might. 2. Place the bridge. Hold the bridge facing down, and place it under the strings. After that, line the strings in the appropriate crevices are push the bridge up, into standing position, securing the strings into the notches before adjusting the bridge. The back of the bridge, facing the tailpiece, should be perfectly perpendicular to the violin. Lots of bridges will be stamped with manufacturing information, which indicates the flat side that should face the tail. The other side should have a slight but noticeable slope. 3. Use the f-holes to align the bridge. 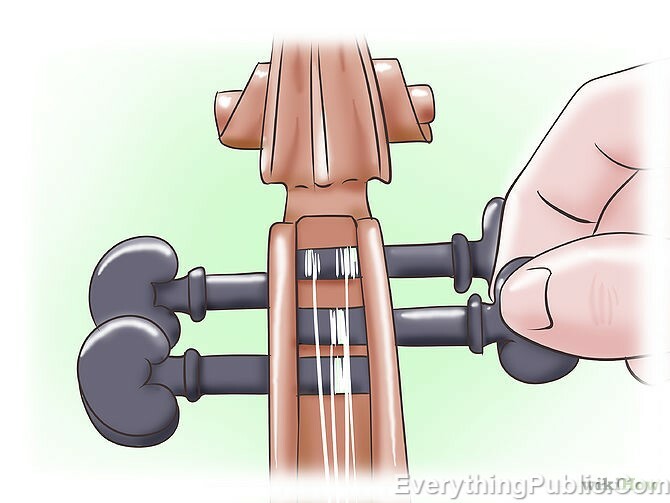 The bridge should be horizontally centered on the instrument so that there is an equal amount of space between each string and the edge of the fingerboard. Use the small nicks on the insides of the f-holes to square the bridge to the center-line of the strings. To center the bridge, use the curve of the “f” on the interior side as a guide. It should align equidistant between them. 4. Let the violin rest. 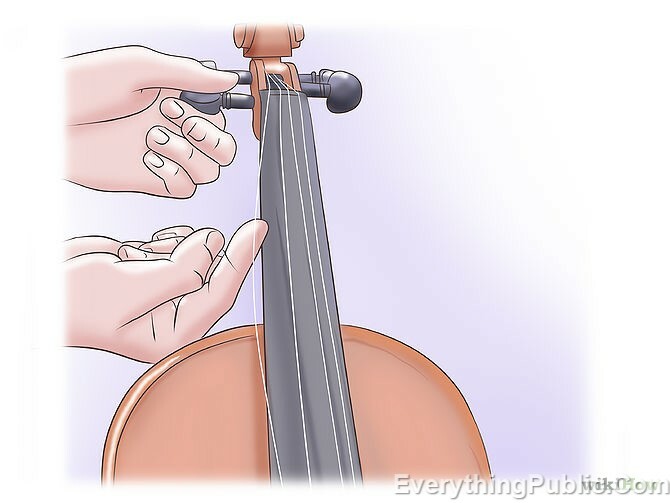 You can tighten the strings somewhat to reduce the rest of the slack when you’ve positioned the bridge, but let it rest for at least 24 hours before attempting to fine-tune the instrument. It’s possible to snap the bridge and ruin all your hard work, and also to pop it out and flatten it against the violin. Let it rest and settle. 5. After a rest period, pull on the strings to stretch them. When you’ve first strung any stringed instrument, it’s common for the strings to periodically slacken and go quickly flat. 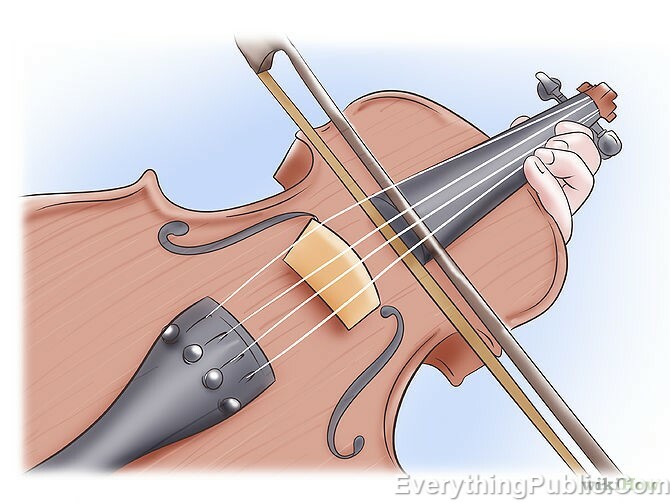 A common exercise to get the tension correct and let the strings settle is to firmly but gently pull the strings away from the neck of the violin, pulling out that slack to flatten the strings, and then tuning them again. It’ll likely take several tunings before you can get the violin into a reliable tune. Stick with it and give the violin the appropriate amount of time to relax. 1. Experiment with different gauges. You can buy strings in a variety of thicknesses, tensions, and styles. Experiment some with different sizes to get a sense of what sounds best with your particular style of playing and your wishes for your sound. Thicker strings put out more volume, resonating with a thicker vibration, while thinner strings tend to be brighter and sunnier. Try a set of each and see what you like. 2. Consider steel core strings. 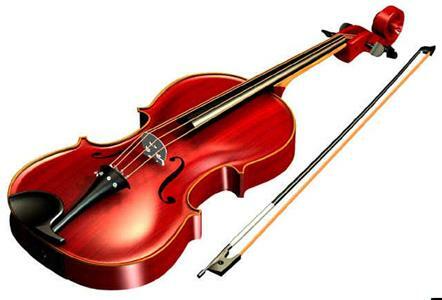 The most basic form of strings used on violins are made of steel alloy, often wrapped in nickel. 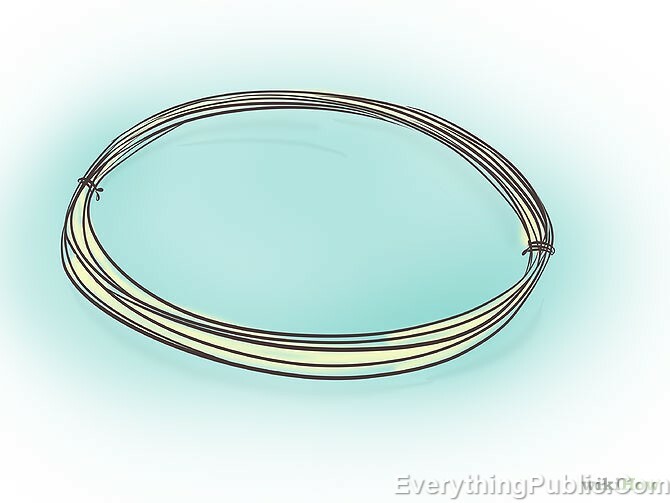 The higher E string is usually plated with some other metal. They tend to have less stretch and durability than other strings, but are by far the cheapest and most widely available strings you can buy. They’re most recommended for beginners and if you’re changing a string for the first time. 3. Take the next step with rope core steel. With a warm sound a quick response, the next step up in the market is rope core steel, which is similar to steel core strings, but braided from more material, giving the player a bright, clear attack on the strings. 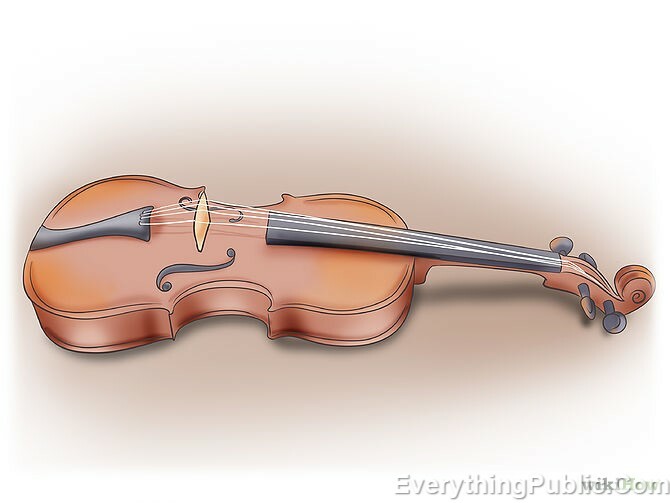 These strings are commonly used by fiddle players. 4. Go old-school with gut strings. It doesn’t get any more visceral than this: gut strings are made of the intestinal tissue of sheep or lambs. While somewhat gross, these strings feature an incomparably warm and lively sound. Gut strings are somewhat fussy, requiring lots of tuning adjustment. They’re greatly affected by weather and temperature as well, making them more useful for very experienced players. Combine with a traditional horse-hair bow and you’ll be playing with the same basic ingredients as the old masters. 6. 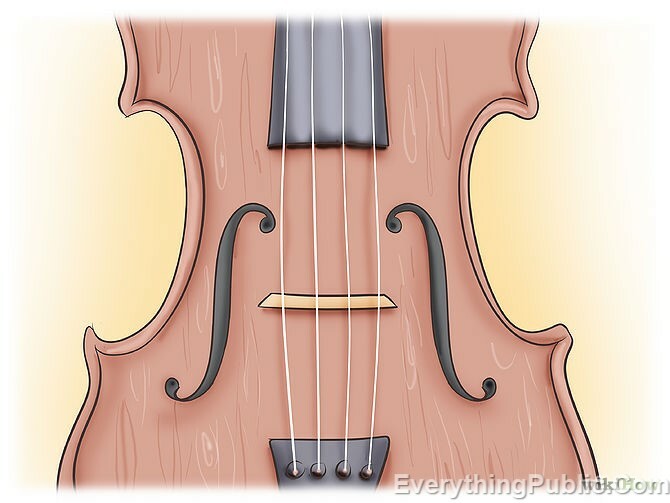 Think about your high E. Most players will put the variety of string on the instrument, while some experienced players like to use particular strings in the E slot for tonal reasons. Violin companies Hill and Westminster make E strings available separately from their respective sets and are popular inexpensive choices to experiment with. This entry was posted in Arts and Entertainment.